The travel industry's premier full-service host travel agency, Nexion provides the most advantageous resources to travel professionals of all experience levels. As a travel advisor, you wear many hats. In today’s day and age, it’s not enough to be a great travel advisor in terms of knowing and selling destinations. You must also think as a business owner with a plan and strategy on how you wish to grow your business. Of course, one size does not fit all. Most of you understand the importance of having a plan and strategy but may not know how to make it a reality – you’re not alone. From my perspective, the best place to start is with your passion and interests. Then, start with understanding who your target customer is and what products they will want to buy. You may have gone through this exercise some time ago, but it’s always good to dust off that plan and reevaluate it to ensure it’s producing the results you seek. For others, you’re not quite there yet. I, along with a team of marketing executives and industry leaders, would love to try and help you take your marketing plan to the next level. This summer, we’re bringing back a Magellan award-winning event that will give you the tools, knowledge and components of a good marketing plan. This three-day event is aimed at all levels of expertise and designed to dive deeper than the basics of marketing. You’ll leave Marketing with your own marketing plan that is developed and ready to put into practice. One of my mantras is “It’s important to work on your business and not just in it.” You may not fully understand what I mean by that. Working in your business equates to the day-to-day tasks you do as an advisor – making bookings, taking final payments, accounting, for example. Growing your business means also taking time to work ON it, and a lot of this centers around marketing. 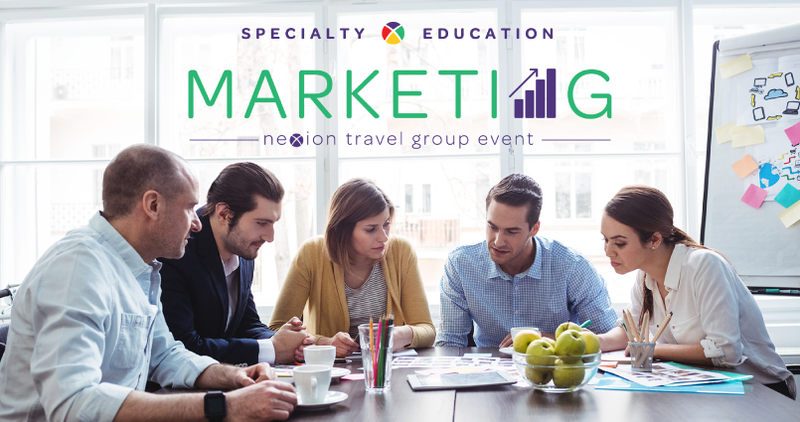 Everything Nexion Travel Group does in terms of education, coaching and specialty events adds value in making you the most effective, efficient and profitable travel advisor you can be. This event is personally important to me, because I truly believe that as much as anything we do, this program will prepare you to take your business to the next level by giving you the tools, knowledge and confidence to develop and execute on a marketing plan that is relevant to you and your business. I invite you to spend three days with me and our experts at Marketing, who are there solely with the purpose to make you successful marketers. It’s going to be a phenomenal event, and I am excited to see the inspiring and lucrative ideas and plan of action that our advisors will put into place and execute from their learnings. To attend, you must be a member of Nexion Travel Group.